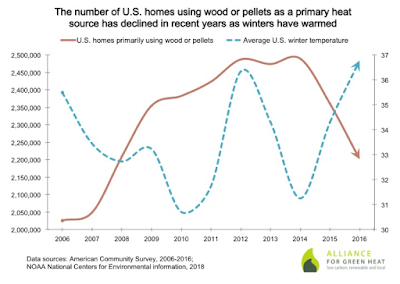 Wood and pellet heating continued to rise during the next few years (see AGH analyses for 2011 and 2012) at an average rate of about 1-2% per year with some states experiencing higher growth. In 2014, the Census reported that an estimated 2.5 million U.S. households used wood or pellets as a primary heating fuel. Since then, however, the number and percentage of U.S. homes primarily heating with wood and pellets leveled off and saw a modest decline. 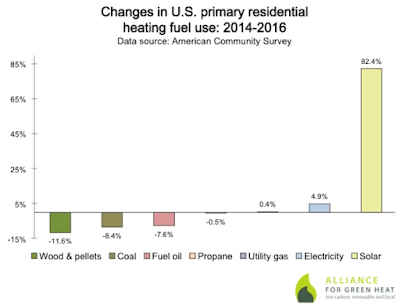 According to the newest American Community Survey, around 2.2 million homes of U.S. homes primarily heated with wood and pellets in 2016—a nearly 12% decline from 2014 and a 9.4% drop from 2011. Census figures suggest that wood and pellet use has fallen the most in the Southern states of North Carolina (down 17% from 2011), South Carolina (-25%), and Louisiana (-20%). 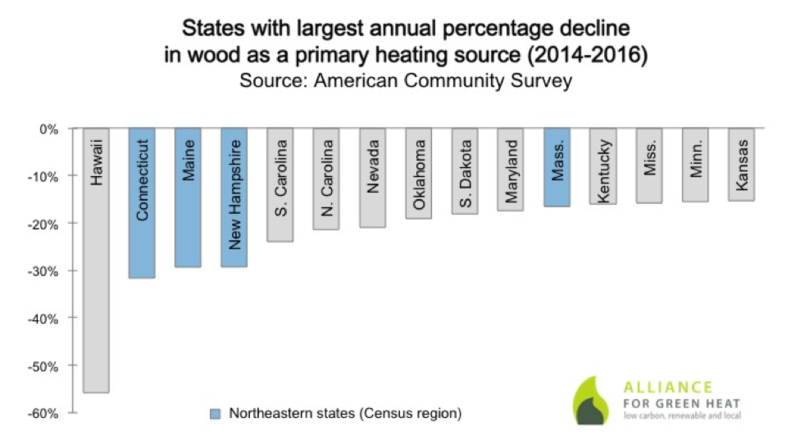 Wood and pellet heat also appears to be on the decline in the Northeastern states of Maine, Connecticut, New Hampshire, and Massachusetts, which may be the result of more homes installing electric heat pumps. 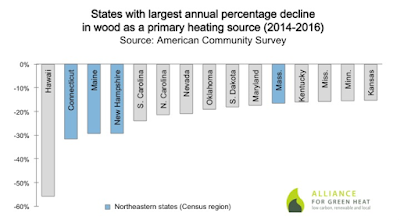 While nearly all states reported fewer homes heating with wood and pellets between 2011 and 2016, the largest increases were reported in Delaware (+20% between 2011 and 2016), New Jersey (14%) Utah (11%), and North Dakota (7%). While wood and pellet use has declined in recent years, electric heat pumps and solar thermal systems are on the rise. 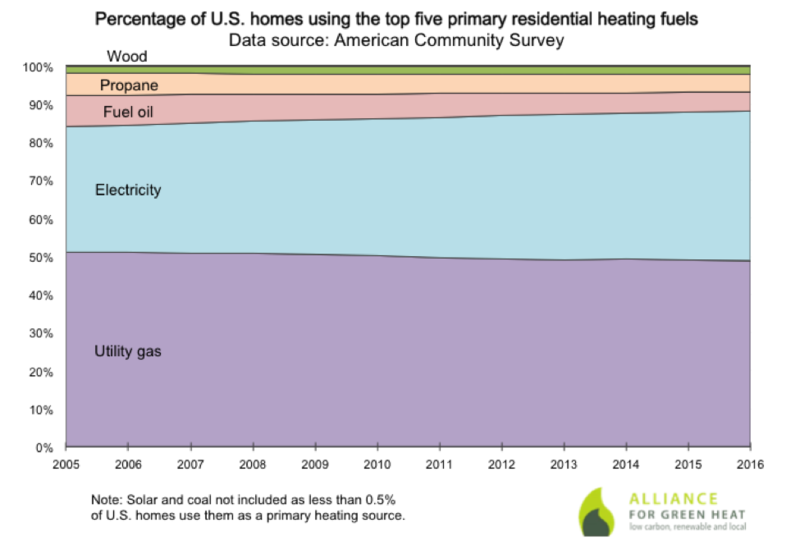 American Community Survey results show that U.S. electric heating rose 10.4% between 2011 and 2016, with the largest increases occurring in Utah (+48%), Maine (+36%), Nebraska (+30%), and Vermont (+30%). About 39% of U.S. homes used electricity as a primary heating source in 2016, making it the second-most common source behind utility gas, which is used in nearly half of U.S. homes. Warmer winters likely contribute to a longer-term decline in wood and pellet stove sales. According to annual data from NOAA, average U.S. winter temperatures increased between 2014 and 2016, which coincided with a decrease in the number of homes heating mainly with wood or pellets. But the big event during the years of this analysis was the economic recession, which lasted from 2007 to 2009. During these years, the number of U.S. homes heating with wood and pellets rose 15%. The use of stoves as primary heater usually goes up when the economy slows down, as people turn on their fossil fuel central heaters less and rely more on cheap wood. When economy is good, families tend to burn more fossil fuels and less wood. Pellet usage may also follow that trend, but tends to be even more volatile than cord wood. While wood and pellet use has declined in recent years, electric heat pumps and solar thermal systems are on the rise. 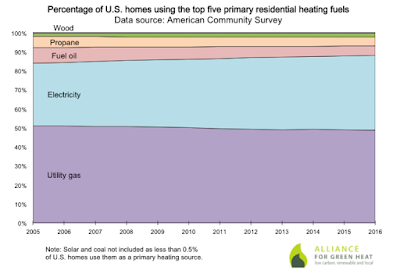 American Community Survey results show that U.S. electric heating rose 10.4% between 2011 and 2016, with the largest increases occurring in Utah (+48%), Maine (+36%), Nebraska (+30%), and Vermont (+30%). About 39% of U.S. homes used electricity as a primary heating source in 2016, making it the second-most common source behind utility gas, which heats nearly half of U.S. homes. 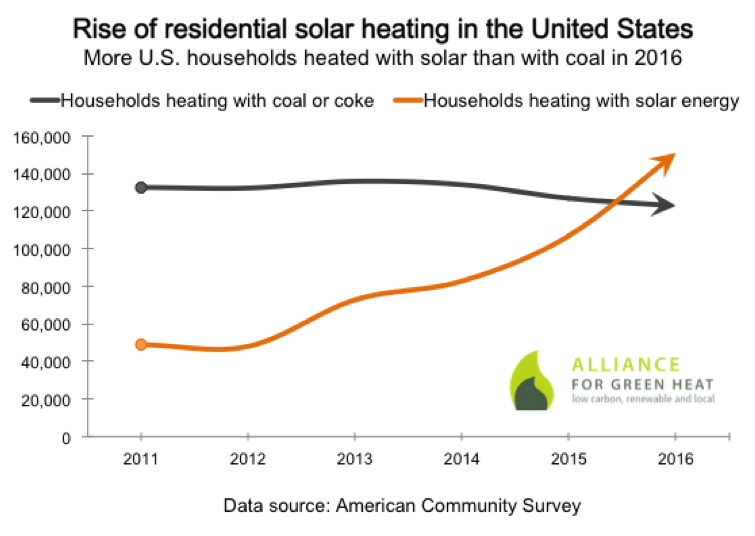 Less than 0.5% of U.S. households obtain their heat from solar energy, but the number of American homes using solar thermal technologies more than doubled between 2011 and 2016. The Census estimated that over 150,000 U.S. homes used solar energy as a primary heat source in 2016, while only approximately 122,728 households (50% of which are in Pennsylvania) used coal. This marks the first time solar surpassed coal as a primary U.S. residential heating source in Census estimates. Maryland, Oklahoma, and Louisiana had the largest increases in solar heating between 2011 and 2016. However, solar thermal remains the most popular in California, Arizona, and Hawaii. 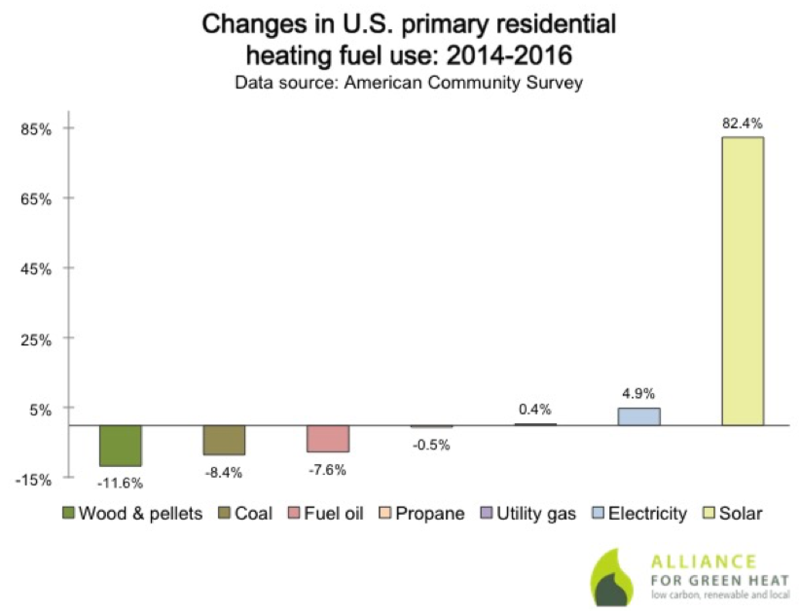 The percentage of U.S. homes using other heating sources, namely, utility gas, propane, and fuel oil, has remained fairly constant over the past few years. 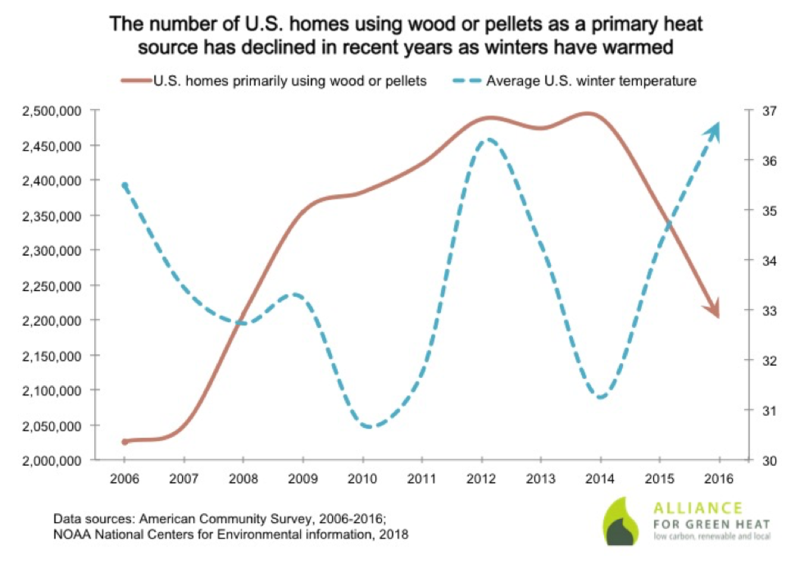 Although the number of U.S. homes using wood or pellets as a primary heat source grew significantly during the 2000s and early 2010s, the overall percentage of U.S. homes remained fairly constant at around 2%. Since the U.S. Census Bureau started tracking heating data in 1950, wood heating has had wide swings. Starting at 10% of the population in 1950, it dropped to 1.3% in 1970, an all-time low. By 1990, wood had climbed back to 3.9%, only to drop back to 1.6% in 2000. The recent decline in wood and pellets as a primary heat source could indicate that wood use is starting to level off. However, this is complicated by the enduring popularity of wood and pellets as a supplementary heating source. The newest Residential Energy Consumption Survey by the EIA estimates that an additional 9.3 million U.S. households used wood as a secondary heat source in 2015. This analysis is based on 1-year estimates from the American Community Survey. The decennial Census, which is used primarily for redistricting, provides the most accurate statistics. The 2017 American Community Survey results will be released in September.